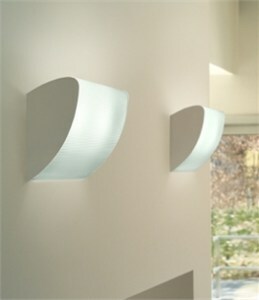 DESCRIPTION ADA compliant wall sconce available in three different sizes and with two light sources. A soft curve of thermoformed satin white or pale green multi-striped glass appears to float off a polished chrome frame. CONSTRUCTION A white metal backing mounts directly to a standard 4�� junction box. The glass displays a semi-elliptical design that shields the lamps from view.